Sous Vide Scotch Eggs | Have YOU Ben Starr Struck? 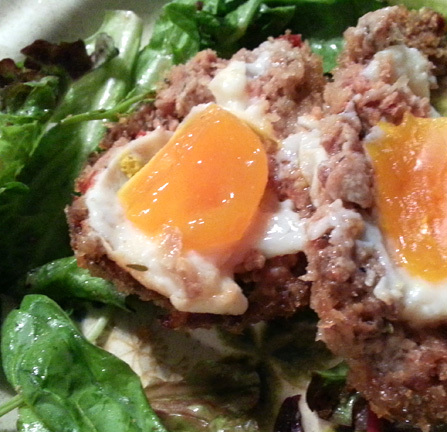 The Scotch Egg was invented in a pub in London, and it was an intriguing, if crude, concept. 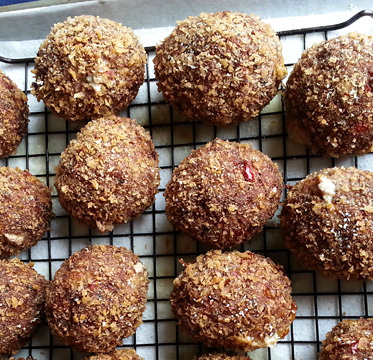 A hard boiled egg wrapped in sausage, breaded and fried or baked to a crisp. But hard boiled eggs are truly one of the worst inventions of mankind. Yes, they are a convenient and nutritiously dense snack. But they require cooking eggs at far too high a temperature to result in something truly delicious. Egg proteins begin to coagulate (ie “cook”) at around 145F, so when we boil them in 220F water, they overcook, resulting in a rubbery white, a chalky yolk, and all too often, an ugly and sulfrous green ring around the yolk. The white and the yolk are the EXACT same texture…silky and custard-like. Nothing like a poached egg, and a universe away from a soft- or hard-boiled egg. But how, I thought, can I implement this so-called 63 Degree Egg inside a Scotch Egg, because it’s so damn delicate. Well, my first hunch was to freeze it solid, so that it could be wrapped in sausage without breaking it. I was worried that the final texture might be affected by the freeze, but it turns out that it doesn’t change it much at all. I did, however, discover the cooking the egg at 147F/64C resulted in a slightly firmer egg that didn’t collapse under the weight of the sausage after cooking. So the final egg texture is a bit firmer than the egg you see above, but still delicate and luscious. If you don’t have an immersion circulator…all is not lost! 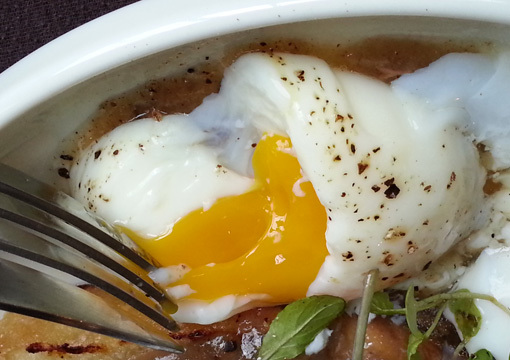 You can make these sous vide eggs on your stovetop, it just takes a little time and patience. Place your eggs in a pot, cover with hot water, and insert a kitchen thermometer. Bring the water to 147 degrees over medium heat. Then turn down the heat and stand there, watching the thermometer. Have a pot of simmering water nearby, as well as a pot of ice water. If the egg bath temp starts to climb above 147, turn down the heat and add a spoon or two of ice water to regulate the temp. If the temp drops too far, add a few spoons of the simmering water. You’ll have to stand there for an hour babysitting the water bath, but you can cook several dozen eggs at a time, and whatever you don’t use for Scotch Eggs, put the rest back in the fridge. They’ll keep for weeks because they’re fully pasteurized and cooked. Just warm them in hot tap water before serving, and crack them right onto the plate! Once your sous vide eggs are cooked, cool them in a cold water bath. Then place them back in the carton and put them in the freezer. Don’t worry if some of the shells have cracked a bit, especially when you chill them. That happens, it’s no big deal. Freeze the eggs solid for several hours. -Your sausage of choice, pressed out into 2 patties per egg, just slightly larger than the footprint of the egg, so you can press the 2 patties around the egg to encase it in sausage. At FRANK we use a housemade venison sausage…feel free to make your own sausage with any ground meat, ground pork fat, veggies, and spices. When you’re ready to assemble and cook, remove an egg from the freezer, give it a quick run under hot tap water, then bang it all over to crack the shell. 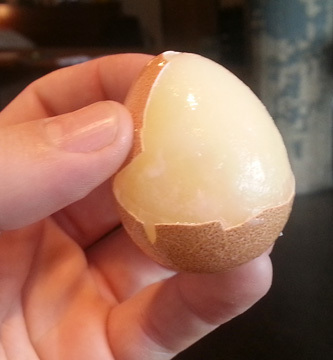 A nice squeeze will generally shoot the frozen egg cleanly out of the shell, but make sure you remove any tiny shell bits left on the surface. Keep the eggs on a cooling rack suspended over a sheet pan. But remember, the eggs inside are still frozen. The residual heat from the fry will gently thaw them, but you need to let them sit at room temp for a couple of hours to let that process happen fully. Before serving, preheat your oven to 300F. Place the eggs (still on the cooling rack above the pan) into the oven for 10 minutes to warm on the middle rack, then turn your broiler on low and watch those eggs like a hawk. When you begin to see some sizzling around the bread crumbs, pull the eggs and serve them immediately. This entry was posted in FRANK, Main Courses, Recipes, Side Dishes and tagged 63 degree egg, immersion circulator, sausage, Scotch egg, sous vide, sous vide fried egg, sous vide Scotch egg. Bookmark the permalink. might be a silly question ? when you sous vide the eggs are the eggs in a zip lock bag or just in the water bath free ? Free in the water bath, Richard! Thank you for your recipe.. I notice you are not doing an egg wash between the flour and panko bread crumbs ?? any reason not to ? Richard, in this recipe, the layer of sausage functions like the layer of egg. 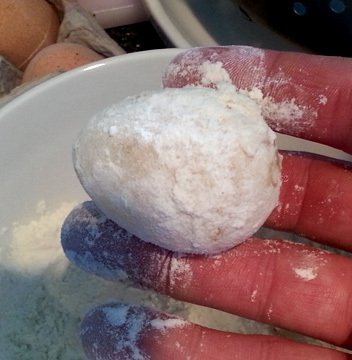 Normally, the egg is there to “bind” the panko to the starchy flour layer, and thus to the item you are breading. But the layer of sausage does the exact same thing, and in fact if you do an egg wash and THEN the sausage, the sausage will have trouble sticking. 1) I cooked the eggs sous vide at 147F for 60 min. I found that very briefly running the frozen eggs under cold tap water helps get the shells off just as well. I then patted them dry with a paper towel before tossing them in the flour. 2) I used Jimmy Dean sage sausage, and it was a little difficult getting the sausage to stick to itself when I didn’t use enough. I recommend using 4oz of sausage per egg to avoid this (1/4 of a standard package per egg). 3) I fried these in a cast iron skillet because I don’t have the means to deep fry them! I had enough oil to cover a little over half of the eggs, and I kept it at 300F. I fried them for 3 min 30 sec on each side, and the eggs were still mostly frozen after frying. 4) I “lost” one of my eggs in my half dozen batch. The egg white started running out from a fault in the sausage. I was able to cut away the small amount of egg white after frying and discarded it, and the egg still looked to be in serving condition! 5) The eggs thawed while I did the dishes, about 10 min. You’ll be able to tell when they thaw because they will slump a little bit and have more give. Then, I threw them into the oven at 300F for 10 min and broiled for a matter of seconds. The yolks came out slightly more firm than the final image in the recipe, but the egg texture was still custardy and delightful! I do, however, still recommend deep frying if possible. In the cast iron skillet, I feel like they had excess oil in them that they wouldn’t have had otherwise. Overall, thanks for the fun recipe! I will definitely make these again for friends, and I find 2 eggs per person to be a good amount of food. I just ate 3 because I was particularly hungry. They came out great even on my trial run, and I’d say don’t be discouraged if it looks like too much effort to “triple cook” these, it isn’t much hassle. I made this tonight for friends. I was doing a menu of elevated bar food. I planned on 4 Scotch eggs but made a 5th as a back up. Things were great as I froze them and of course one didn’t freeze properly, but enough I could get it in the sausage. I followed your directions, but not sure if the sausage was a little to thick as it was still a little pink in the center of some of the finished eggs and I did keep them in the oven longer than you recommended. I will try again, but make the sausage thinner. It was fun to try with my Sansaire sous vide I got for Christmas. Thanks for having an easy to read recipe. Great report, Debbie! Yes, depending on the thickness of your sausage, it may need to stay in the fryer a bit longer or shorter. Gotta do a few extra to test! Let me know how your next batch goes! DEFINITELY an interesting project to try out!! FYI Ben, after seeing some show on ‘sous vide’ cooking techniques, I became interested in finding some means to provide the stated 143 degree water. I should add at this point that I ‘jury rig’ stuff all the time in my woodworking workshop – like finding something to draw a perfect 11 3/4″ circle on a piece of wood when my compasses only ran to 10″…..another story entirely! Anyway, It turns out that if I set my slow cooker to medium, half filled with hot water, then remove the lid, after an hour, the temperature is exactly 142 degrees. I have used the sous vide technique many times especially on marinated boned, skinless, tasteless chicken breast with wonderful results – takes about 6 hours of cooking and tastes surprisingly good and moist – and as an added incentive, the cooking time does not appear to be critical – up to 8 hours works fine! John, you never cease to amaze me. Yes, one of the cool things about sous vide is that you CAN’T overcook meat if your target temp is the temp of the water bath. You can cook a steak at 130F (medium rare) for a WEEK and it will still be medium rare. Are you putting your meats directly into the water bath, or putting them in ziploc first? I tried putting meat in direct (YUK!! – I don’t particularly like boiled chicken) then ziplock, but BY FAR the best results (and safest) came from using vacuum bags – it forces the flavor of the marinate into the meat and is far safer as the vast majority of air has been removed, hence ‘sous vide’ – under vacuum! Very true, John, however, the most dangerous pathogen of them all, c. botulinum, flourishes in vacuumed environments with no oxygen. So it’s VERY crucial to FULLY cook meats with the sous vide method to eliminate all traces of c. botulinum. 185F for 5 minutes is the CDC recommendation, but that’s far above the well-done point of most meats, so an extended cooking time at lower temperatures is necessary, and a preliminary sear to kill any surface contaminants is a good plan. ANYONE looking into sous vide cooking for the first time needs to get a solid reference book to know if they are cooking safely! Not VERY and not even “crucial” to fully cook meats. I bet you never “fully” cook fish, even if you should, as stated by USDA. Cooking safely means following a certain set of rules/map for a certain “killing rate” of a specific bacteria/virus/microorganism, being it salmonella or botulinum (depends on the type of aliment or meat). For certain types of cooking you need to pasteurize ar 6.5D, for canning at 12D, but you have a set of rules for every situation.